Small hearted Oshawa Mayor refuses $77 worth of swim tickets for low income children attending local social services daycamp. This faulty judgement was a real concern to many Oshawa residents so they dipped into their own pockets at the embarrassment of the decision of their Mayor, John Henry, who as chief executive and his $150,000 salary couldn’t find it in his own pocket or in any of his discretionary city spending accounts as Mayor. The guy needed Council Approval our Chief Magistrate said. Anyway, with all of the embarrassment this caused the city, some junior employee, I guess, saw the mayor’s very juvenile judgement and overruled him to come up with the necessary change. Conference Board of Canada study—Best places to live and work in Canada–Of 50 municipalities rated, Oshawa was 50th–last place. Part of this rating is undoubtedly due to the significant bad press this term of city council has brought to the city. Mayhem at Oshawa City Council…Our city council meeting turned into a 3rd world government Sept. 3, 2013 with the presence of armed undercover police invited by the mayor and city administration assaulting citizens viewing the council proceedings where city council fired the auditor general thus removing all independent oversight of city hall spending. The attack and beating up of citizens showing an interest in the governance of this city was a black eye on Oshawa’s international reputation and an embarrassment to all of our citizens. OSHAWA—WE’RE FAMOUS—Interestingly. A Chinese friend of mine was visiting her father in a smaller Chinese city 4 hours south of Beijing just after this incident. Her father was aware of this attack on citizens and asked his daughter, my friend, whether this was common police action in Canada, and expressed some concern for her safety. Amazing! Here Oshawa’s Channel 12 CHEX News coverage of the assault of citizens attending the Sept 3, 2013 Council Meeting. Mayor John Henry, Chief Magistrate of the City claims he had nothing to do with inviting undercover police to the meeting…so I wonder, if the Mayor did not invite the police and order the assaults, is there someone else in charge that can order such serious attacks on citizens at city hall? I just wonder who is in charge. Another view of the Sept 3, 2013 council mayhem.. —. Here’s the Police Docket listing names for Durham Police Undercover Officers to Arrest at Sept. 3, 2013 Council Meeting that the docket says they’d been invited to. 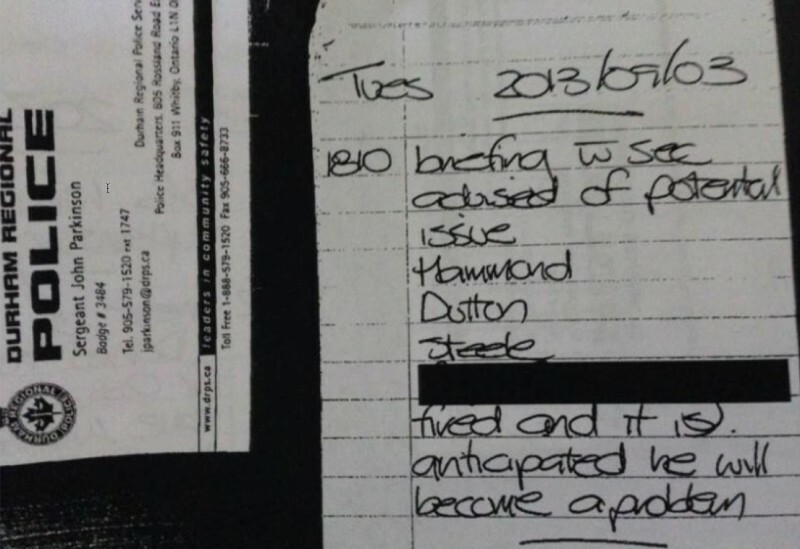 Speculation that the name crossed out is the name of the Auditor General fired that night. Hammond and Steele were assaulted, cuffed, and taken to jail, Dutton was escorted to his car by police, and interestingly, this police report says the Auditor General is to be fired before the council meeting began and George Rust-D’Eye delivered his report to council recommending termination of the Auditor General and elimination of his position—but Rust-D’Eye recommended the AG position be replaced by an “Integrity Commissioner”, and “Oh Yeah”, he spouted, “I’d be available for that job!” Fire him and hire me was the result of $115,000 of taxpayer’s money for that? Oshawa Express Editorial re Sept 3 Council mayhem suggesting the upcoming Municipal Elections provide an opportunity for City Voters to cast their vote as a comment on the widely published Sept 3, 2013 actions of the last city council that saw the city painted internationally as a third-world democratic backwater. The city vote will be a referendum on the use of force and on the treatment of citizens. As the editorial states, The September 3rd incident was a traumatic event with far-reaching repercussions and calling into question the practices of the mayor and city council, the police and the public. Classic Brian Nicholson Political doublespeak–Here he is, the guy, who seconded the motion to put the General Vote Plebiscite on the 2006 Municipal Ballot and one of the council members who devised the “convoluted question” and the “lack of information” process to hoodwink voters into voting for what the councillors wanted, a return to the General Vote. This article was published just prior to the 2010 General Vote Election with Nicholson calling the general vote unworkable and an impossible election system for voters. Guess he was trying to miss any public backlash and reduce any public responsibility for his important role in this undemocratic and irresponsible council action. Canadian Civil Liberties Association has harsh criticism for Oshawa City Council…says its stifling of public input and participation infringes on freedoms guaranteed in Canada’s Bill of Rights. AND NOW THE LATEST –Mayor Henry, Councillors Bouma, Diamond, England, all members of the voting block of 8 on every issue including 1) Overspending on the Wentworth Waste Transfer facility without a business plan, 2) Hiring George Rust-d’eye at $115,000 for a month’s work to write a report justifying firing of the City Auditor General, 3) Voting to fire the Auditor General and eliminate his office to insure against independent oversight of city spending, 4) Voting at every instance to insure ward voting was not implemented for the upcoming election, 5) Plotting quietly to sell the revenue producing PUC which would have resulted in higher electricity rates for all city households, and 6) Ballooning up the city debt by $30M, and 7) Voting for every city tax increase, and now they have conspired together to have Mayorality Candidate Dan Hammond charged with Harassment. Earlier, they had voted on a few occasions to sue private citizens and city councillors who stood in their way. The other members of the voting block with the same voting records of those named above are Councillors Pidwerbecki, Sanders, Aker, and Chapman. all of whom, along with those named above, must go if Oshawa is to have a progressive council. Municipal Election experts discuss merits/demerits of the ward and general vote election systems. Bill Longworth presents 600 name petition to city hall asking that ward elections be implemented for the upcoming Oct. 25 municipal elections. Bill Longworth argues that council approving asking voters their desire to go back to ward elections is a waste of time and is designed to simply provide the aging incumbents another council term without the need for lodging an extensive campaign, It will not provide a binding vote on council and the question asked will largely dictate the result. In any case, Council has sole and exclusive right to determine the electoral system. Bill Longworth asks council to implement ward elections for the upcoming municipal elections. No need for a time-wasting plebiscite he says. Bill Longworth appeals unclear and ambiguous city hall electoral system question to the Ontario Election Commissioner(July 18, 2014) and wins new clearer question for city voters. Council may ignore results of ballot question to return ward voting no matter the result because politicians don’t like ward voting 1) because it increases their accountability to voters, 2) it increases their workload in representing community problems, and 3) it increases the work required for them to be re-elected. They’d have to actually get out and talk to voters, LOL. This is why we need to elect Bill Longworth so that he can work within council to see that council actually implements the ward question result. The Oshawa City Council has been called dysfunctional with lawsuits, threats, plain clothes officers assaults on citizens watching council proceedings, firing of the Auditor General and eliminating his position to avoid independent oversight of city expenditures, and Provincial investigations of illegal in-camera meetings of some council members. Longworth presents 600 name petition to council asking for immediate return to ward voting. Government transparency, even in Oshawa, is in danger of being lost and an independent, objective, and responsible FREE PRESS is a key to maintaining an informed public to allow democracy to flourish. The city doles out millions of our tax dollars subsidizing profit making enterprises in the city, particularly the university, the housing developments related to the university, and the new downtown hotel. In some cases there is insufficient due diligence in handing out our cash. Remember, every dollar handed out is lost to civic administration and has to be made up by residential and industrial/commercial taxpayers. City Council is dysfunctional and lawsuits and sanctions abound applied by council to those members who don’t toe the line demanded by the Diamond/Henry 8 person voting block. Incidentally perks, such as council chairs/vice chairs that come with extra pay are provided in return for votes….so neophyte councillor Amy England was provided a vice-chair position at the Region for voting in support of the incinerator despite campaigning against it…See this story on the machinations leading to a lawsuit. Legends Centre a sinkhole for taxpayer cash. It was built in 2005 and has suffered since its first days with leaking roofs, cracking internal floors, and crumbling external concrete walkways. Most of the roof has already been replaced but requires close to another million dollars to complete the job. Council reports it needs to spend another million dollars this year in addition to the million spent in 2011. Council heavily publicized the building as winning a North American Design Award when it was built but the city staff experts must have been AWOL during construction and the writing of contracts.